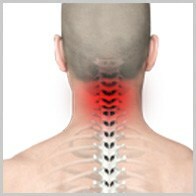 Neck pain relief is a common issue and inquiry for patients when they visit a spine surgeon. The Good Body health website reports that neck pain ranks as the second most common form of chronic pain in the nation today; affecting a full 15 percent of Americans. The causes of neck pain are as many and varied as the demographics of people who suffer from this condition. A young person might sustain a neck injury while playing a sporting game. A middle-aged professional might slouch in front of the computer at work, suffering neck aches as a direct result. Older arthritis sufferers also endure sharp discomfort in this region; and people of all ages can suffer neck pain due to injuries, nerve compression, worn joints, strained muscles and disease. Most people can achieve neck pain relief without the aid of surgery or professional medical care. In many instances, common household remedies like drugstore meds, bedrest, heating pads and ice packs, and low impact stretching exercise can do much to experience neck pain relief. If the patient experiences shooting neck pain accompanied by a weakening of the arms or hands–or strong shoulder and arm pain–this may be a sign of a more serious health condition where surgery may be the only way to achieve neck pain relief. If you are experiencing radiating neck pain that shoots down the arm without relief (and maybe felt also in the hands or fingers), a cervical herniated disc may be to blame. These symptoms also may be indicative of foraminal stenosis, a condition that results in the narrowing of the spine in the neck. This ailment results in a pinching of the nerves, along with numbness or tingling in the hands or arms. For a large percentage of people suffering from this neck pain, treatments like over the counter anti-inflammatory drugs, prescription pain relievers or back braces usually offer little to no relief. If you have tried these treatments and have not experienced any neck pain relief that your daily mobility has been limited, the only other treatment option would be stenosis or discectomy surgery. Make sure to set up a consultation with Dr. Moazzaz so that he can professionally evaluate your condition to determine the correct course of action for you to experience neck pain relief. Sometimes throughout the course of everyday life, daily activities like computer work and long commutes can result in slow gradual spinal issues such degenerative disc disease and arthritis of the neck. These people can experience neck pain relief now and reduce their risk at an older age by changing their lifestyle, exercise habits, and daily posture. Through his years of expertise as an orthopedic spine surgeon, Dr. Payam Moazzaz has acquired the ability to detect and diagnose these conditions by way of high tech imaging tests, (CT, XRAY or MRI) and offer the correct neck pain relief to his patients. If you seek neck pain relief from symptoms that begin as minor discomfort but worsens and intensify over time, particularly during specific activities and positions, then you may be suffering from symptomatic cervical disc degeneration. Cervical Disc Degeneration is a process that often comes with aging, but does not come accompanied by symptoms. The force of an injury, however, can prompt the occurrence of symptomatic pain. This can be associated with the frequent motion of specific body parts, such as the neck, arms and shoulders. To experience neck pain relief from Cervical Disc Degeneration, surgery is usually the only option once common practices of icing, stretching, pain relievers, and anti-inflammatories have been exhausted. Cervical Degenerative Disc Disease surgery (Cervical DDD) relieves the pressure on the nerve and/or the spinal cord, which will reduce neurological issues you may be experiencing like radiating pain up your arms and arm weakness. This neck pain relief through surgery tends to have a great rate of success, averaging between 80 – 90 percent effective. Some people wake up and go to sleep with neck pain and discomfort, but find neck pain relief experienced as they go about the motions of their daily routine–especially if their day happens to be warm and temperate, as opposed to rainy and dark. This may be a symptom of cervical osteoarthritis or neck arthritis. How Do I Experience Neck Pain Relief? Neck pain can be acute, chronic, and boast a number of causes. And accordingly, a number of treatments are available to address and provide neck pain relief. These range from long rest periods and a regimen of over-the-counter medication (to remedy mild neck strain) to a regular schedule of stretching, physical therapy, spine manipulation or the employment of a soft cervical collar to support the neck (in the case of chronic neck pain). If these treatments fail, then injections or spine surgery may be considered as a last result. Schedule a consultation today with Dr. Payam Moazzaz to have your condition diagnosed professionally, and he will help you choose an option for you to experience neck pain relief.